Raised in mid-March of 1777 by wealthy Beverley Robinson, the Loyal American Regimentconsisted almost entirely of New York loyalists from lower Dutchess and Westchester Counties. Robinson managed sixty thousand acres and 146 tenant farms in Dutchess County. Not surprisingly, his own tenants (and relatives)accounted for a large percentage of the soldiers and officers of the regiment. See a detailed sketch of Robinson & his signature. Robinson, a childhood friend of George Washington, was one of the wealthiest men in the New York colony and like any good leader, he played the game of politics well by eventually gaining access to British Commander-in-Chief Sir Henry Clinton. Robinson quickly became Clinton's friend and trusted advisor. View an actual recruitment notice for the Loyal American Regiment that appeared in 1779 in Rivington's Royal Gazette, a loyalist newspaper printed in British-occupied New York City. 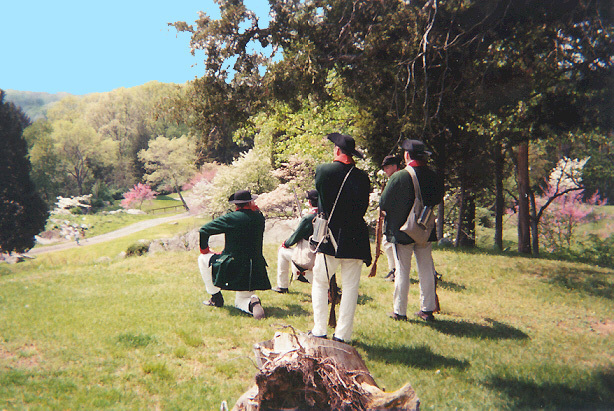 The recreated LAR stands at the exact position in Stony Point's upper works where a detachment of the original LAR was captured in July 1779. LAR soldiers in Capt. Barns' Company burned Continental Village, NY on October 9, 1777. They were detached to Emmerich's Chasseurs. The LAR was garrisoned variously at Kingsbridge (near present-day West 230th Street and Marble Hill Avenue) and Bloomingdale (close to present-day Columbia University) on Manhattan Island as well as a stint on Long Island at Flushing, NY (referred to as Flushing Fly in LAR muster rolls and various Loyalist orderly books). See Lossing's 1840's sketch of Kingsbridge. Using a detailed map of the battle at Stony Point, NY, the recreated LAR musters at the exact spot where the original regiment camped in the fort. 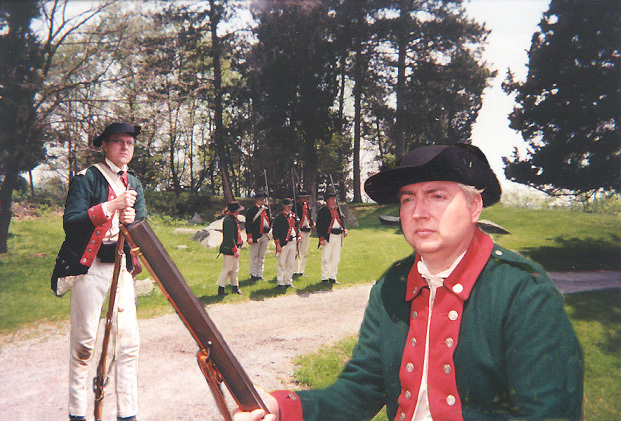 The recreated Loyal American Regiment portrays Captain Barns' company of the LAR... and an interesting company it was. According to his memorial dated 1786 (Audit Office 13/21), Captain Joshua Barns was an inhabitant of Westchester County NY before the war, and was commissioned by Governor Tryon to recruit as many as possible in his native county. He claimed to have been angered at being offered only an ensign's commission in the New York Volunteers. Later, he joined the LAR as a captain in April of 1777. He was detached to Emmerich's Chasseurs (see below), occupied the barracks at Fort Montgomery NY after a successful action on October 6, 1777 and quite obviously stole rebel property, including a pair of leather breeches for himself (see the fascinating Barnes' court martial proceedings). At his court martial, many LAR officers presented damning testimony yet he was found not guilty of plunder and cowardice in 1779 and went with the LAR to Virginia under Benedict Arnold in 1781. Once there, he is suddenly no longer in the LAR for reasons unknown. Perhaps he resigned, perhaps he was seconded -- the reasons are not entirely clear. Some sources report him dead but one must wonder how could he personally have submitted a memorial for his losses in 1786 if this was the case? According to his memorial he stayed in New York City from July 15, 1783 to March 25, 1784 when he apparantly made his way to New Brunswick, Canada (where the LAR was exiled - see below). Although one of the witnesses for his claim was Lt. 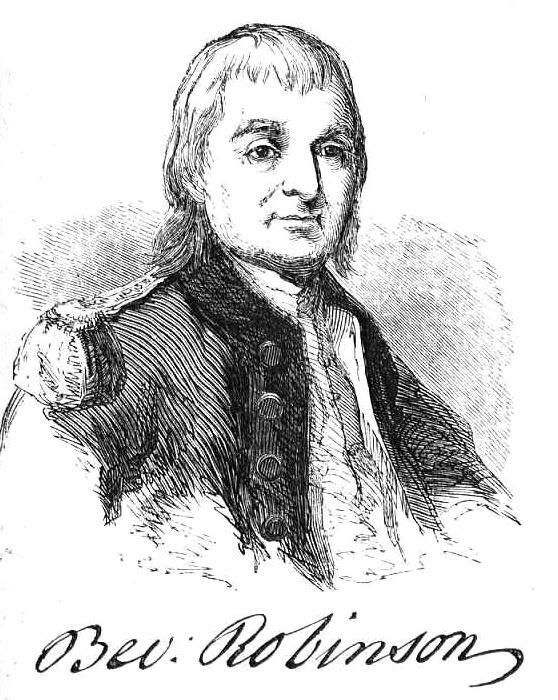 Governor Fanning of the Island of St. John (previously the commander of the King's American Regiment), Barnes' claim was rejected on November 29, 1786. He apparantly received no land grant and disappeared to an unknown fate. 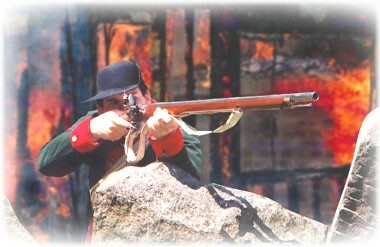 In 1777, Captain Joshua Barns and most of his company of the LAR were detached as marksmen to Emmerich's Chasseurs under the command of Andreas Emmerich and were to the right of the LAR's position in the attack on Fort Montgomery in 1777. "Certain light infantry troops were known as Jagers in the German army and as chasseurs in the French army." Encyclopedia of the American Revolution). View an actual muster roll for Captain Barnes' company from 1777. View a composite of muster rolls - collected from various sources - for the entire regiment covering 1777-1783. 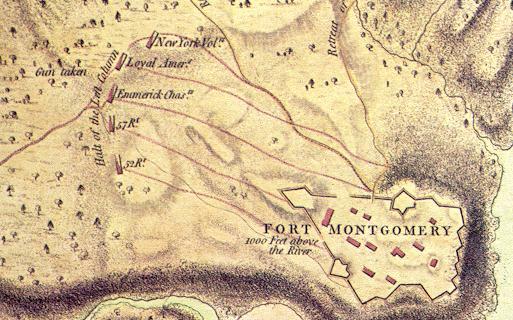 British Captain Patrick Ferguson took in members of the LAR in 1779 to serve as rangers and riflemen on his ill-fated expedition to South Carolina -- an expedition which ended in disaster at King's Mountain. Finally, Captain Morris (son of Beverley) Robinson's company was detached to the corps known as the Provincial Light Infantry under British Lt. Col. John W. Watson of the Brigade of Foot Guards. It is interesting to note LAR influence. Thomas Barclay, the Major for the LAR, served as the Major of the Provincial Light Infantry. "I have this consolation,that I acted from upright and conscientious principles, in doing my duty to my king and country, and was it to do over again I should take the same part, for no circumstance in life can ever make me forfeit my loyalty to my king nor zeal for the good of my country." When the war officially ended in defeat for the Crown in 1783, loyalists were forced to leave America. As part of the mass exodus to Canada, the Loyal American Regiment left New York City 6 in the transport ships Ann and Apollo and headed to Fredericton, New Brunswick where they received a land grant known as Block 12. Once there, the men of the regiment started their lives over. Some stayed (Thomas Spragg, for example). Some moved on to other parts of Canada. A harsh, but revealing statement of the loyalists' mindset. From Gaine's Weekly Mercury, October 11, 1777. John Ramsey was born in Kintyre, Scotland. He came to America and settled on the Island of Saint John (Prince Edward Island) and initially joined the Royal Highland Emigrants before being transferred to the LOYAL AMERICAN REGIMENT. After the war, he returned to the Island of Saint John, became an adjutant in the Prince County Regiment of local militia. He died in 1804. -- from An Island Refuge: Loyalists and Disbanded Troops onthe Island of Saint John, edited by Orlo Jones and Doris Haslam, page 228-229. "Lieutenant Anthony Allaire, Loyal American Regiment of Provincials, tried by the General Court Martial for taking and detaining a sword belonging to the late Lieutenant Campbell of the 52nd Regiment and for suffering himself to be ill-treated by Mr. Hunt as afterwards by Adjutant Cunningham of said regiment, the court, having considered the evidence the prisoner Lieutenant Allaire, is of opinion he is not guilty of anything in taking the sword of Lieutenant Colonel Campbell that can impeach his character and do therefore acquit him with honor of any blame on that account, and think also that his youth and inexperience in the service are sufficient reasons for his being cleared of censure on account of his disputes with Hunt and Cunningham and do therefore acquit him of the same . . ."
From "Loyalist Anthony Allaire" by Ruth Scott. Officers Quarterly, Summer 1997, page 8. This is a publication of the York-Sunbury Historical Society of Fredericton, NB. From Benedict Arnold: Patriot and Traitor by Willard Sterne Randall, page 500-501. 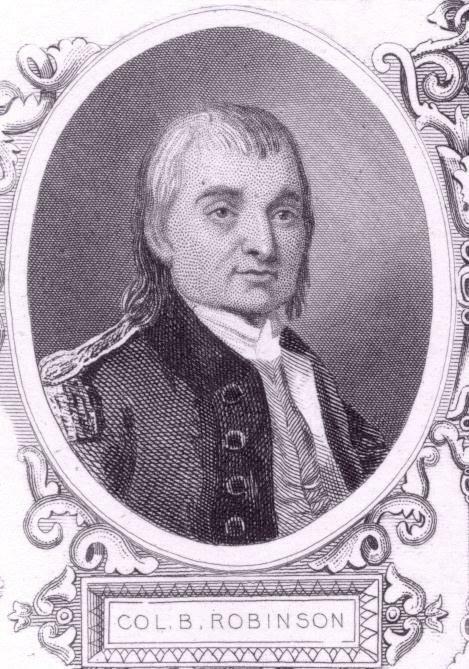 Lieutenant John Ward of the Loyal American Regimentcommanded the last detachment of Loyalist troops to leave New York City when the British handed it back to Washington's forces. From The Loyalists of New Brunswick by Esther Clark Wright, page 87. Ward also wrote of the wretched conditions the loyalists faced when they reached Canada. This is the correct spelling: neighbour. Don't be fooled by yankee alterations to the King's English. From Lorenzo Sabine's Loyalists of the American Revolution, Volume 1, p. 207.